The Columbus Police Department asking for the public’s help in locating 42 year old Danielle Holloway who has been missing since October 10, 2015. Holloway was last seen in Columbus, Georgia in the 3500 block of 8th Avenue area on Saturday, October 10. Danielle Holloway is said to be mentally disabled and was last seen wearing a teal colored T-shirt, blue jeans with bleach stains, teal and gray tennis shoes. No picture was provided in the reports. Police say that she may be hanging around the East Wynnton Road area. Police say Danielle Holloway, 42, was last seen in Columbus in the 3500 block of 8th Avenue area on Oct. 10. Police also say Holloway is mentally-disabled. She was last seen wearing a teal colored T-shirt, blue jeans with bleach stains, teal and gray tennis shoes. Danielle is 5’2”, weighs between 120 to 140 pounds, with brown eyes and black hair tied in a ponytail, and an overbite. She may be heading to the East Wynnton Road area. Any information concerning this subject please contact the Columbus Police Department. If you have any information, please contact Columbus Police at 706-653-3449 or 706-653-3449. 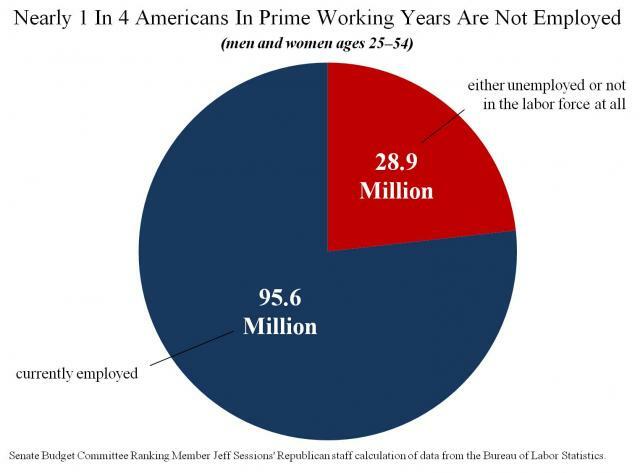 From The Weekly Standard comes the following … 1 in 4 Americans betwwen the ages of 25 and 54 are not working. Add this to the record number of Americans on food stamps and claiming disabilities. And then there is black unemployment that is soaring. Of course this is how you create a dependent government class of people, make the welfare state their only source of income. It is disgusting how this government gets in the way of business. If it is not a business they approve of, they will squash it. A new chart from the minority side of the Senate Budget Committee shows a startling fact: Almost 1 in 4 Americans between the ages of 25-54 (or prime working years) are not working. Not only is Barack Obama the Food Stamp president, he is the Disability president as well … So this is what “Hope & Change ” looks like. More records for Barack Obama not to be proud of. CNS is reporting that the total number of Americans receiving federal disability benefits hits a record high of 10,988,269 in December, 2013. That was up from the previous record set in November of this year. 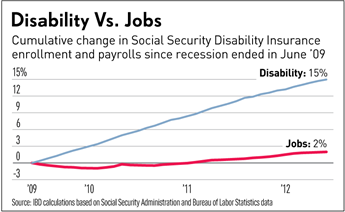 Also, the average monthly benefit paid to a disabled worker also hit a record of $1,146.43 in December. What else are individuals going to do except go on food stamps and disability when the economy stinks. Thus, the real reason the the unemployment number is decreasing. It has nothing to do with people getting jobs, but everything to do with people no longer looking for employment. The total number of people in the United States now receiving federal disability benefits hit a record 10,988,269 in December, up from the previous record of 10,982,920 set in November, according to newly released data from the Social Security Administration. The average monthly benefit paid to a disabled worker also hit a record of $1,146.43 in December, up from a previous high of $1,130.34 in December of last year. Spouses of disabled workers also got a record average monthly benefit of $308.13 in December, up from a previous high of $304.31 in August. Children of disabled workers also received a record average monthly benefit of $341.42 in December, up from a previous high of $337.13 in May. As CNSNews.com reported earlier this month, the number of Americans getting disability benefits now exceeds the entire population of Greece, which is 10,772,967, according to the CIA World Factbook. But wait, how can record number of Americans still be increasing on disability and food stamps … I thought the recession was over? Barack Obama is killing this country. As reported at the Washington Post, President Barack Obama and his families trip to Africa will be one of the most expensive trips ever and cost the American tax payers between $60 and $100 million. That is correct. As millions of Americans are unemployed, under-employed, and struggle to get by on a day to day basis. This takes place as a record number of Americans are on food stamps and disability. This occurs as so-called sequestration has caused government departments to cut back and furlough workers. Barack Obama has said in the past that every one has to have skin in the game and must sacrifice? That is everyone but him. As Weasel Zippers states, “Just as long as the King and Queen of America enjoy themselves.” This man truly is a community agitator. Who does this at a time that the United States finds itself in record debt? So let’s understand this, fighter jets will fly in shifts, giving 24-hour coverage over the president’s airspace, a Navy aircraft carrier or amphibious ship, with a fully staffed medical trauma center, will be stationed offshore in case of an emergency but yet Americans were left to die in Benghazi without any military help within an 8 hour range? Really? Furthermore, we are in the midst of questioning the IRS for their lavish and over the top wasteful spending, yet Obama’s jaunt to Africa gets the rubber stamp of approval? The LEFT will be quick to say, well Bush did it. Is that really a defense? I thought Obama wasn’t W? We realize that other presidents have gone on expensive trips as well, but this president is not supposed to be like others. Obama says he cares about the poor and the middle class. Obama claims that he identifies with the common man and plays class warfare. However, this imperial, do as I say, not as I do, let them eat cake president just snubs his nose at the American people and does any damn thing he wants at the expense of ‘We the People”. What a disgrace. Hundreds of U.S. Secret Service agents will be dispatched to secure facilities in Senegal, South Africa and Tanzania. A Navy aircraft carrier or amphibious ship, with a fully staffed medical trauma center, will be stationed offshore in case of an emergency. Military cargo planes will airlift in 56 support vehicles, including 14 limousines and three trucks loaded with sheets of bullet­proof glass to cover the windows of the hotels where the first family will stay. Fighter jets will fly in shifts, giving 24-hour coverage over the president’s airspace, so they can intervene quickly if an errant plane gets too close. The elaborate security provisions — which will cost the government tens of millions of dollars — are outlined in a confidential internal planning document obtained by The Washington Post. While the preparations appear to be in line with similar travels in the past, the document offers an unusual glimpse into the colossal efforts to protect the U.S. commander in chief on trips abroad. Obama’s trip could cost the federal government $60 million to $100 million based on the costs of similar African trips in recent years, according to one person familiar with the journey, who was not authorized to speak for attribution. The Secret Service planning document, which was provided to The Post by a person who is concerned about the amount of resources necessary for the trip, does not specify costs. The Weekly Standard reports that after the WAPO questioned the costs of a planned family safari, the White House nixed the plan. So does that mean if we question the entire trip, they will cancel this ridiculous, over-priced boondoggle as well?